Why should Vermont enact a tax on Carbon? A tax that would ultimately artificially increase the cost of gasoline, according to proposed legislation, by 89-cents a gallon, add 58- cents to each gallon of propane, and $1.02 to a gallon of heating oil or diesel fuel and add similar costs to natural gas. The often-heard arguments made by proponents are that we need to do this as one measure to combat Climate Change and its effects. The implication here is that if we pass this carbon tax, we will in some way be preventing future catastrophic storms and preserving everything we love about winter in Vermont. This is fundamentally dishonest. If one accepts the predictions of climate change activists — that by the end of the century if we do nothing we can expect a rise in temperature of between 1.5 C and 4.5 C. – Vermont enacting a Carbon Tax will have zero direct impact on that temperature trajectory. Even if we accept the most optimistic expectations for action — say that all of those people in Paris who are meeting today followed Vermont’s example, enacted all of their Carbon reduction plans and put them into practice tomorrow, the best case scenario for impact on global temperatures by the year 2100 is 0.17 degrees C of mitigation. That’s according to calculations by Bjorn Lomborg, of the Consensus Center of Copenhagen. So, our actions in Vermont, even coupled with our indirect influence sparking similar action on a global scale, will not save winter in Vermont or alter any future violent weather patterns. To lead people to believe otherwise – that this is the benefit they will achieve in return for the sacrifice of living under a carbon tax — is fraudulent. In fact, recent comments by Chris Recchia and Asa Hopkins of the public Service Department regarding Vermont’s Comprehensive Energy Plan affirm that affecting global climate temperatures is not even an objective of Vermont’s Energy Policy, nor is there any intention or plan to influence other states or countries through our actions. To quote Hopkins, Energy Policy Director for DPS, “We are focused on trying to take a path forward that works for Vermont. We’re not taking action … in hopes of inspiring action elsewhere.” Why? Because even if you accept the science, it’s just not realistic. So, if the objective here is to save the ski or the maple industries, to prevent future Irenes from happening, or to otherwise preserve Vermont’s climate as it is for our grandchildren — passing a Carbon Tax is not a solution. It won’t have any noticeable impact on climate trends. It WILL impact aspects of our environment locally, however. And these impacts WILL be noticeable. In order for that statement to be true, it means that we have to develop a whole lot more renewable energy production facilities in state for those dollars to flow into. (No doubt Mr. Blittersdorf will be happy to oblige.) In fact, part of the revenue generated by the Carbon Tax would be used specifically to subsidize such renewable energy development, at least according to the proposals. In a talk before the Addison County Democratic Party, Mr. Blittersdorf envisioned 200 miles of ridgeline developed with 500 foot wind turbines. Keep in mind, Vermont is only154 miles long. And even this would require by some estimates tens of thousands of acres of solar panels to make up the difference in demand for power. Although all of this development would not be subsidized entirely by a carbon tax, it is a stated objective of the Carbon Tax legislation to help move us toward the goals laid out in the Comprehensive Energy Plan, which does call for such development. The industrialization of so much wilderness and pastureland for energy production will have a profound effect on the aesthetics of Vermont, bird and bat populations, deer, bear, and the migratory patterns of other animals. Construction of solar facilities on large areas of land, for example, results in soil compaction, potential alteration of drainage channels, and increased runoff and erosion. The clearing and use of large areas of land for solar power facilities can adversely affect native vegetation and wildlife in many ways, including loss of habitat and interference with rainfall and drainage. Long term, when the useful life expectancy of the solar panels comes to an end in twenty to twenty-five years, we will have a massive disposal challenge. A cost-effective system for recycling solar panels has not yet been developed. Enacting a Carbon Tax will have a negative impact on the human population of the state as well, as such a tax will harm the economy and, thus, the ability of our citizen to live and prosper in Vermont. Or, at least the overwhelming majority not working for ventures directly subsidized by the Carbon tax. The REMI study believes, “The carbon pricing cases with the revenue options have a positive net impact on the Vermont economy, mostly because of reduced imports of fossil fuels from other states—and therefore more dollars staying within Vermont. This reminds me of a funny meme someone recently posted on facebook that said, “Why buy it for seven dollars when you can make it at home with 96 dollars worth of craft materials.” Trade is usually a much more economically efficient and beneficial way to allocate resources and advance prosperity. By enacting a Carbon Tax and reallocating the revenue through government programs that will end up picking winners and losers (a process that always invites cronyism and corruption), we will inevitably waste a lot of money that would be better spent elsewhere. Let’s be clear, under this Tax what they are defining as “what we don’t like and want” — in real life terms — is driving to work, transporting goods and services, heating our homes and places of business, taking our kids to school, soccer games and ballet lessons, and keeping working landscapes working with things like tractors and trucks. As a state, our responsibility is to conduct a serious cost benefit analysis this proposal. We have to weigh the benefits of burdening our state with a half-billion dollar a year Carbon Tax vs. the negative impacts such a tax would bring. In the end, passing a Carbon Tax in Vermont, even if the revenues are in fact used it to subsidize the projects outlined in the various proposals, will not improve the global climate, and, therefore, will not prevent tropical storms or other extreme weather events, nor will it save the maple sugar and ski industries decades down the road. There is no discernable benefit here to counter the sacrifices of living under a Carbon Tax. On the negative side of the ledger, however, these policies will have an undseireable impact on our local ecology… it will turn our economy upside down … the proliferation of subsidized renewable energy plants throughout the state will lower our property values … it is an assault our Vermont “brand” as a place of open spaces and pristine landscapes, and the rural lifestyle that is the number one reason people choose to live in Vermont. If we pass a carbon tax, we will not pass on to the next generation a Vermont that is one iota cooler or more meteorologically stable than it otherwise would be. It will be, however, uglier, less accessible, more expensive, and harder to find a job. In our analysis, a Carbon Tax is a bad deal for the people of Vermont. Great Opening Rob. Very well said and explained. 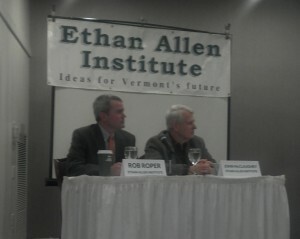 A carbon tax will do one thing, make Vermont a place that working people and businesses cannot afford. As you said and I don’t this VPIRG understands VT is rural and gets cold so it will make VT a place to leave not a place to stay and raise families. Thanx so much for your hard work on this and bringing it to our patriot mtng!